Posted on June 18, 2015 at 11:44 pm. At Leo Vegas Casino, there are three types of casino bonuses which are handed out to players: a deposit bonus, free money and free spins. Throughout the calendar year, www.LeoVegas.com advertises some killer promotions which fall into these three categories of bonuses. We want to briefly clear up any misconceptions you may have about the different kinds of player bonuses, and also inform you of the promos and bonuses currently on offer at one of our most highly regarded ‘instant play’ online and mobile casino sites. The Deposit Bonus – This kind of promotion is bonus cash credited instantly to your account upon making a deposit. For example, a 200 per cent matched deposit bonus up to $50 (currently on offer for first-time depositors at www.LeoVegas.com) means you can deposit $25 and you will get $50 in bonus cash credited to your account, which you can play with immediately. Note that you will have to wager through the bonus funds a certain amount of times before being able to withdraw any winnings. Read through the terms and conditions to make sure you understand the regulations which come part of the parcel with this kind of bonus. The Free Money – As the bonus name suggests, free money is free money. Leo Vegas hands out free cash to loyal players from time to time, so be sure to check your email for weekly updates of promos and prizes which you might be eligible for. Again, you will have to wager through the free cash or any winnings from it before you can withdraw the money. The Free Spins – Leo Vegas has a history of dolling out plenty of free spins for its catalogue of video and interactive pokies game. Right now, new members are eligible for 20 free spins simply upon opening an account, and on your first deposit, you are also eligible for an additional 180 free spins on selected games. The free spins bet is predetermined and will vary from promotion to promotion. For example, you may be awarded 30 free spins on the Starburst online and mobile pokies game, with each free spin valued at a $0.20 bet. Any winnings you collect from your bonus free spins are credited to your account as bonus winnings, so like the other bonuses, you will be required to wager through those winnings a specific amount of times before you can withdraw the cash. 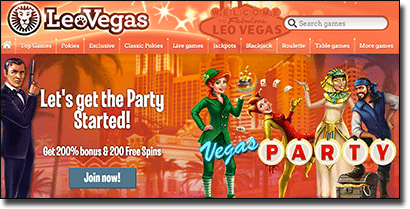 If you head to www.LeoVegas.com via desktop, laptop, smartphone or tablet, you can browse through the current promotions being marketed to Australian players, along with the hundreds of real money games available to play, such as roulette, blackjack, interactive slots, baccarat, video poker, scratchies, live dealer games like poker and more. We guarantee your money and personal details are secured at Leo Vegas and can vouch for the quality and fairness of all the games. Online gambling for Australian residents is 100 per cent legal and you cannot be punished for accessing and using the services provided by offshore interactive casino operators. Leo Vegas is a licensed, registered and regulated Internet gambling website and adheres to strict gaming policies set out by independent testing agencies.